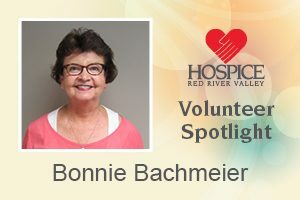 I recently retired and was interested in giving back to the Fargo community. A friend of mine mentioned Hospice. It was almost like a calling. I met with the volunteer services manager for an informative meeting, and the rest is history. Not sure of my accomplishments, but I know what a good I feeling I have when I leave the residence of the one under Hospice care. Their appreciation and kindness makes me eager for my next visit. Whether it is preparing meals, light housekeeping or just a visit, the volunteering I do for Hospice fits into making it perfect day.